An Anime wouldn't be as good as it is without music. When you pay attention to add you actually hear music all the time! They usually match well with the style and atmosphere. Think about strong and louder soundtracks in Battles or emotional and touchin. On Dec. 31, 2013, SAO: Extra Edition aired in Japan. It was a two-hour special that mostly recapped the events of the anime from last year. The timing of the special episode's release was no coincidence. At the end of the year, we tend to look back and get ready for the year to come. The producers of SAO did the same by letting us look back at the story thus far and preparing us for Sword Art Online II, the teaser to which is viewable on YouTube. As fans of the light novel series know, the story continues in another virtual game called Gun Gale Online, and it was rumored that this Extra Edition would officially announce the anime's sequel. The teaser shows the character Shino Asada firing a sniper rifle. The anime will be released sometime in 2014. Kotobuki expressed her surprise at her casting, saying that she never imagined that she would be in the film. Kotobuki said she assumed the male mindset when she played Jiji, since the cat assumed various symbolic roles — for example, Kiki's father figure or a grandfatherly figure — from scene to scene. Kiki actress Fūka Koshiba (Iki mo Dekinai Natsu) said that Kotobuki's Jiji voice is cute and exactly how she imagined Jiji would talk when she was on set. 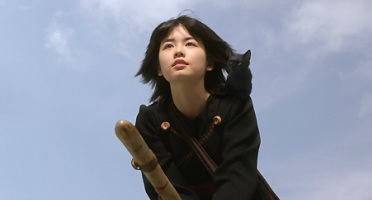 16-year-old actor Ryōhei Hirota plays the critical role of Kiki's friend Tombo in the new film. Co-starringwith Koshiba and Hirota is Machiko Ono (Suzaku, Like Father, Like Son) as Osono, the owner of the bakery where Kiki works. Hiroshi Yamamoto plays Osono's baker husband Fukuo, and Miho Kanazawaplays a woman named Saki who visits the bakery. Rie Miyazawa (Oceans, Hana, Peony Pavilion) plays Kiki's mother Kokiri, and Michitaka Tsutsui (Reunion, Ballad: Namonaki Koi no Uta, Shikoku) plays Kiki's father Okino. Additionally, Tadanobu Asano (Ichi the Killer, Lupin III) will play veterinarian Dr. Ishi. Takashi Shimizu (The Grudge/Juon, Tomie: Rebirth) is directing the film, and Satoko Okudera(Summer Wars, Wolf Children, The Princess and the Pilot) wrote the screenplay.